This year’s theme for the first ever national community-led housing conference was ‘Hope for Housing’. And it was just that – a ray of hope in an otherwise hopeless housing market. The conference meant for 200 delegates attracted over 500 and many had to be turned away. So here is a roundup from our insider Anne Fennell’s for those who couldn’t make it, and useful links for those who want to take the next step. Lots of inspiring people took to the stage to share their stories about how they are leading community-led housing schemes around the UK at this one day conference full of hope. This ray of hope is so important because it provides solutions that allow people to take matters into their own hands to be able to afford homes, and feel part of a community. Currently the opposite is true. Not being able to afford a home means ordinary people feel they aren’t in control of their destiny. They’re anxious about not being able to provide a home and stability for their family; of being out-priced and excluded from communities they’ve been brought up in; of having to move far from parents whose support is so valuable to young growing families and who in turn as old age creeps in need the comfort, support and care of their children. Moreover the housing market itself appears to be monopolised by a few big developers who want to maximise profits by squeezing families into the smallest space possible paying the maximum rent or mortgage possible, regardless of what people can afford. Houses are seen as investments rather than homes. The uncomfortable truth is that as these investments become more profitable for the few so homes become unaffordable for the many, particularly the young. House prices are now 6x, 10x, 18x the average wage in some areas. But community-led housing provides an alternative model. It is a people-powered housing solution. The idea is simple: to help people and communities build their own homes with the needs of the community in mind and with prices that are truly affordable. The Housing Minister Alok Shama MP affirmed his support for the movement by launching a £240 million Community Housing Fund, the first of its kind, over the next four years, providing £60 million of funding a year to support the community-led housing movement. Grants will be given to local authorities to allocate to community groups and the fund will be open for applications from January 2018 and assessed in spring. An advisory body is being set up to help those wishing to apply. Sign up to the Power to Change newsletter to get more information as soon as it’s released. 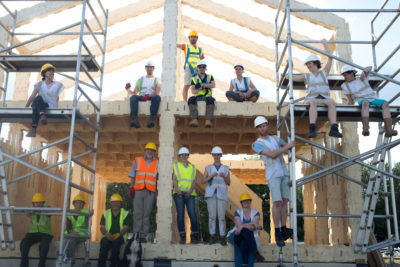 Ethical banks Triodos, Ecology Building Society, Charity Bank, offer advice and support for those wishing to invest and build homes in their communities. Community shares are also a great way of raising local investment from local people, and getting them to co-own the project. Crowdfunding is also an option. Some local councillors in Stevenage and Croydon have embraced the idea of communities taking back control and are looking to find ways of making this more possible. For example, the Council renting land on a long-term basis for the purpose of community build, or proposing a community development with part houses at market price which pays for the houses at truly affordable rents. Lyme Regis Community Land Trust shared practical steps about partnering with a housing association or going it alone. Community groups come in all sorts of shapes and sizes to meet different kinds of needs. A wonderful and inspiring video was shown (you can watch it below) of a group of women over 50 who have worked with Barnet Council in London to build a community of small apartments. The Older Women’s Cohousing project has helped these women create a new community, and free up their old property for families. They take care of each other, they meet for communal meals once a week, the community provides companionship, support, conversation, gardening, cooking. These ladies know they do not have to grow old alone. The value of this in the wellbeing of these women and in future savings to the NHS is probably immeasurable. Animate Cohousing are looking at doing something similar in Oxford. It was a ray of hope for housing. Currently those who set up community-led housing schemes are pioneers: they are the brave, the foolish, the risk takers. But the hope is that as interest and demand grows this area will become more mainstream with citizen and State working together to enable ordinary people to build homes that foster and replenish communities. More and more people are opting for tiny homes with lower-running costs, lower ecological footprint and simpler lifestyles.